Photo 40: 1909 Boys basketball team: Seated are coach Floyd Poteet and Superintendent W. H. Simons. The players are Glenn Wood, Hubert Voller, Earl Irwin, Eugene Woods, and Raymond Andrew. Photo 6. 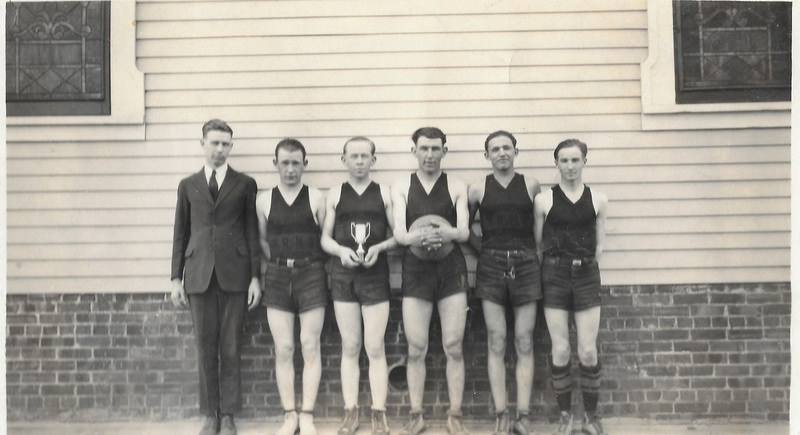 Undated picture of a basketball team. Some of the players are the same as in the 1909 team but appear to be slightly older - or not..... Oddly, the player in the front row right looks like the coach in the 1909 picture! Photo 884: 1912 Basketball team. Raymond Andrew, back row left, is the only one identified. Photo 893. This is undated but possibly the 1920s based on thes style of uniform. On the back it says Coach Tillotson, and then identifies the players as Charles Boyles, Bud Barrett, Ernie Boyles, Roy Shepard, and Roy Aylor. It looks like they are standing by the Methodist Church, which was not in good shape when remodeled in 1912. Photo 67 (a photocopy): 1970 Basketball team. Coach Dave Oman. Back row: Richard Burgert, Pat Workman, Ed Kroll, John Petrash, Jim Goodenkauf. Front row: Arlyn Parde, Marty Conrad, Don Smitt, Tom Mullins, and Steve Cumro. A few random advertisements and articles: UNDER CONSTRUCTION, DATES TO BE ADDED!